How do you like the event? Poll closed Jul 30, 2018 . Welcome lords and ladies to the first annual summer fishing derby! Bring your boats, fishing poles, and winner's luck for your chance to win! Here's what you need to know. Points will be assigned to items due to rarity. Regular fish will start at 1 but super awesome epic items will be 10 (see list at the end of this post). There will be chests set up at /warp magievent with your username and mine locking them. You can only have one chest. 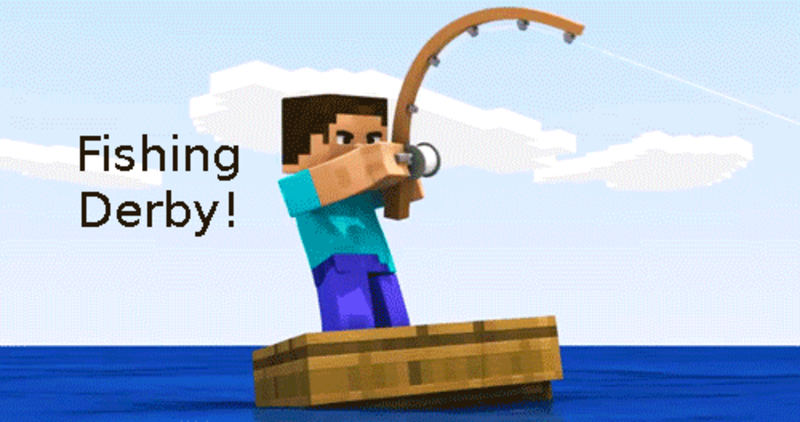 You are encouraged to use /warp fishing for your fishing. No bringing in outside items to store in chests it will be considered cheating. Anyone caught cheating will be disqualified. Cheating is defined as using outside items to up your stats, stealing, griefing, interfering with other participants in any way, or trying to bribe your way to victory. You can use enchanted fishing rods. The rules are subject to change if more must be added they will be. You keep what you fish up and will have a week to move your stuff starting midnight of the last day and ending the next week on the corresponding day at midnight. Items will be stored for you in Magi in Turrim for up to an additional week If items are not claimed by speaking with a member of Magi in Turrim leadership or a server staff member then it will be assumed you do not want to keep them. Empty chests will be removed and items donated at /warp recycle. When the contest ends, we ask that you allow time for the judge (myself) to get screenshots and catalog everyone's chest before you move it. Screenshots will be posted on the forum and a final list of items and points assigned to them, and will also be available at that time. Please be sure all stack-able items have been stacked before judging begins. The most points win. There will be first, second, and third place. First place gets Angel Wings and Santa's Rod , second place gets Santa's Rod. Third place gets Spoopy Rod. Participants will get a water breathing potion at the end of the event. I would also like to remind you all we have a discord that you can use to chat while you fish. It's not required, but it's easier than stopping to type. Have you ever played animal crossing? In AC you can compete with others to fish up the largest fish. I wonder if there's a plugin we could get so that we could fish up all different sizes of fish and have a separate prize for that? Just an idea! I feel like someone like me who doesn't have so much time to be on the server would benefit from a more luck based system that I have more of a shot at than someone who is online more than I am. Lapis Lazuli is not listed above. How do you join? llike for example do you fish and store in a chest? Go to /warp magievent and buy a book, sign the book and drop it in the hopper at the chest you spawn at. Wait until you have a chest. When you do, use that chest to store fished up stuff. you have until the end of July to fill the chest with items you want to count. I'll be randomly checking people. Also, if I catch people cheating I'm going to be very harsh on them. I'm staff so I can check info that non staff can't No worries, I got this. Leather armor is also missing. I guess they give 1 point? Ding ding ding, you win bragging rights for being right.